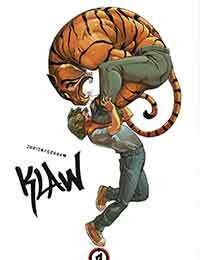 Klaw Average 0.00/5 - out of 0 total votes. A population of secret were-animals hide among us, and young Angel Tomassini is about to learn just how widespread—and dangerous—it is!Beautifully illustrated by Joel Jurion, best known throughout Europe and the worldwide animation industry for his gorgeous and dynamic character design, written by Antoine Ozenam, this exciting young adult series explores a world of ancient conflict hiding just under the surface of modern life as we know it. With identifiable coming of age themes overshadowed by thrilling action sequences and a deep, enthralling mythology, this book will introduce readers to a world unlike anything else on shelves today. Collecting the first three chapters of this original ongoing series—Awakening, Tabula Rasa, and Unions—this book comprises "The First Cycle" in the epic, hidden universe of Klaw!